Unifii provide no information on their website about who owns or runs the business. The Unifii website domain (“unifii.io”) was privately registered on May 5th, 2018. Further research reveals Unifii affiliates naming Ron Montaruli as CEO of the company. Circa 2012 Montaruli (right) was Director of International Sales are FreeLife International. More recently, Montaruli served as Chief Operating Officer for 3T Networks. 3T Networks emerged earlier this year. The company’s business model was a combination of securities fraud and pyramid recruitment. Alexa traffic estimates for the 3T Networks website show a steady decline since April. This suggests 3T Networks has or is on the way to collapsing. Read on for a full review of the Unifii MLM opportunity. Unifii markets “Prosperity U” for $279.95 and then $79.95 a month. Through Prosperity U Unifii provides signals to their investors through the Telegram messaging app. Properity U also includes “altcoin reports”. Unifii provides no disclosures regarding their signals or altcoin investment advice. Unifii’s compensation revolves around the sale of Prosperity U memberships to retail customers and recruited affiliates. To qualify for commissions a Unifii affiliate must continue to pay the $79.95 monthly Prosperity U fee or maintain two retail customers with active Prosperity U memberships. Unifii pays a $60 commission when a retail customer purchases a Prosperity U membership. A $15 residual commission is paid on retail customer monthly fee payments. Unifii pays recruitment commissions via a unilevel compensation structure. To qualify for residual recruitment commissions, a Unifii affiliate must recruit and maintain at least two active affiliates. Unifii pays residual recruitment commissions via a 3×9 matrix. These three positions form the first level of the matrix. Positions in the matrix are filled by direct and indirect recruitment of new Unifii affiliates. These recruited affiliates generate residual recruitment commissions when they pay their ongoing Prosperity U monthly fee. How many levels of the matrix a Unifii affiliate earns on is determined by total monthly fee volume generated by affiliates in their matrix. GV stands for “Group Volume” and is counted at a rate of 80% of each $79.95 monthly fee paid. Unifii pays residual commissions using the same 80% $79.95 Prosperity U monthly fee calculation. 40 GV for every active retail customer Prosperity U membership is also paid through the matrix. The above percentages are also used to pay residual commissions on the 40 GV generated by residual retail membership fees (40 GV). For each ten personally recruited affiliates, a Unifii affiliates receives a new matrix position within their existing matrix. Each new matrix position effectively allows an affiliate to earn additional commissions on the same position within their original 3×9 matrix. Unifii pays a matching bonus on via the same unilevel team structure as recruitment commissions. Note that the above earnings qualification criteria are cumulative. Unifii affiliate membership is $279.95 for Prosperity U and then $29.95 a month. Unifii’s Prosperity U signals service pretty much sounds like what 3T Networks was offering. I haven’t seen anything that indicates Unifii’s signals service is automated, so securities wise they seem to be in compliance. Unifii’s compensation plan however is pyramid recruitment with token retail hitched on. Unifii forces affiliates to purchase Prosperity U when they sign up. After the initial $279.95 has been paid an affiliate can stop paying the $79.95 monthly fee and still qualify for commissions by having two active retail customers. Despite not existing until May 2018, Unifii claim a signals track record of 640% from July to December 2017, and 157% from January to April 2018. Unifii brands these results as their own, which is a fraudulent representation because Unifii didn’t exist up until a few weeks ago. Not withstanding, my original point was with the ROI examples provided – so why would an affiliate opt to stop using the service? This pretty much negates the retail membership qualification option. 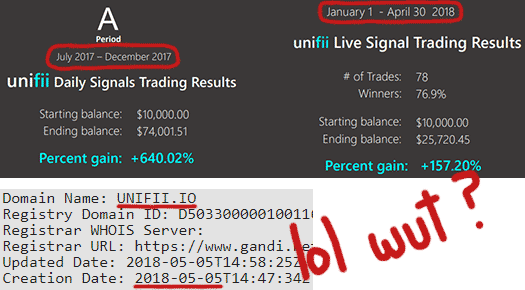 Unless of course Unifii’s signals fail to live up to their made-up results history. That would kill any chance of retail customers paying for the service, which means the majority of Prosperity U memberships would be held by Unifii affiliates. Not that this probably isn’t going to happen anyway. It is after all far easier to package Unifii as a $279.95 and then $79.95 a month recruitment scheme with signals benefits, as opposed to convincing retail customers of legitimacy with fraudulent result histories. If Unifii really wanted to stand behind their signal service, they’d require maintenance of two active Prosperity U memberships to qualify for any residual commissions. Another question to consider is why is 3T Networks is failing if the signals are delivering as promised? As former COO of the company, perhaps Ron Montaruli can provide an answer. 3T Networks’ trajectory is that of any other pyramid scheme. A recruitment hype bubble that eventually pops. I’m not seeing why Unifii will turn out any different. Update 4th December 2018 – Apparently Unifii’s 157% returns every few months wasn’t enough. The company has now launched VIP Global FX, a passive forex trading service. That has to be one of the easiest scams to pull off simply by using stock images of professionals, stock traders and economists and build a site that accepts payments likely in crypto. The sell is in the imagery to give the illusion you know what you are doing and look the part or at least enough to trust a man in a suit. It’s a mistake so many people keep making and to this day it still works! Of course depending on the gullibility of your target market and given luck is in your favour retention may be hard to maintain but hey, plenty more suckers willing to play the game right? Nice to see you are back to scamming Mike Klingler! Ron Montaruli and I were best friends from 1981 to 2010. Ever since he divorced his first wife and moved from St. John’s, NF to Vancouver, BC in 1991, he has been involved with one dodgy, scam businesses after another. When we last spoke in 2010 I called him a filthy shyster. He ended that call and we haven’t spoken since then. What I find so very disgusting is that he became a ‘born again christian’ about 15 years ago but he seems to really enjoy ripping off poor suckers.